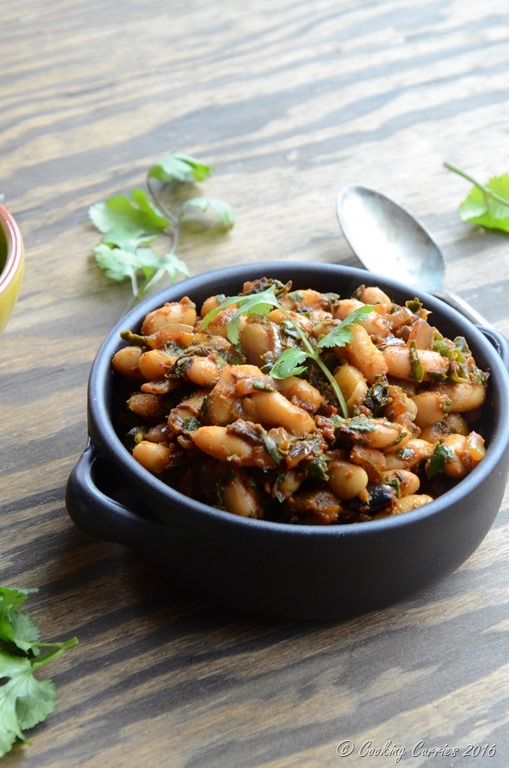 A hearty, simple and delicious side to any weeknight meal – you will be surprised how much you will love this red chard and cannellini bean sauté. I just love it when you don’t really have a plan and just start cooking and as you do things kind of fall in place and you end up with something delicious. Most of the time, I roughly have a plan. At least I would start of thinking I want to make a penne with brown butter sauce and roasted Brussels sprouts or rice and rajma masala or something like that. Some other times, I take out one vegetable from the refrigerator, start chopping up some onions and garlic ( I have to have onions and garlic in anything Indian I make, at least onions), open the pantry to look up some spices, pick out a few, toast or not, throw them in the pan with the onions and garlic and so on. I usually have a basic base I stick to and modify a little on top of that. Believe me when I say that those little modifications are enough to bring in a whole lot of different flavor and taste. I had some Red Chard I bought from Whole Foods and what I usually make with it is a stir fry with coconut (thoran ) or a red chard curry with lentils and ground coconut with spices (koottu). I have always eaten them with rice, so that is how I like it. Now if I made either of these curries, I would have to make rice and then something else to go with the rice as well. Now, I was just pure lazy! I wanted to make something simple, take out the frozen chapatis from the freezer, heat them up and eat. A girl can sometimes wish for less too right?! So, that’s what I did. 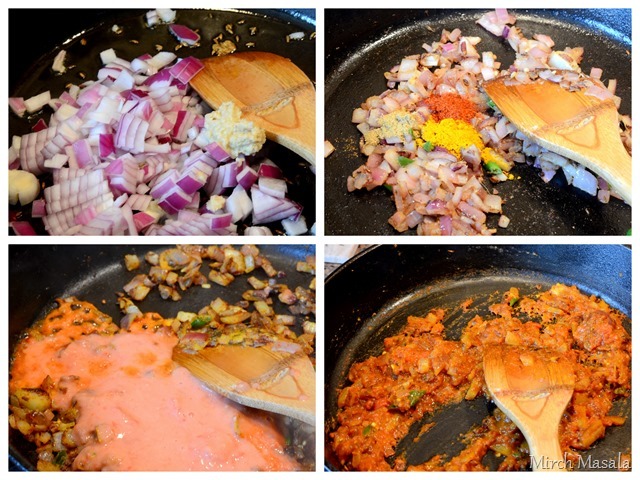 I followed my basic curry for chapatis recipe – heat oil, sizzle cumin, sauté onions, add ginger garlic paste, turmeric, cayenne, coriander powder, grind some tomatoes and add that to it. Let it cook till water evaporates. Add red chard, canned cannellini beans, salt, mix well. Take out those chapatis, heat them. 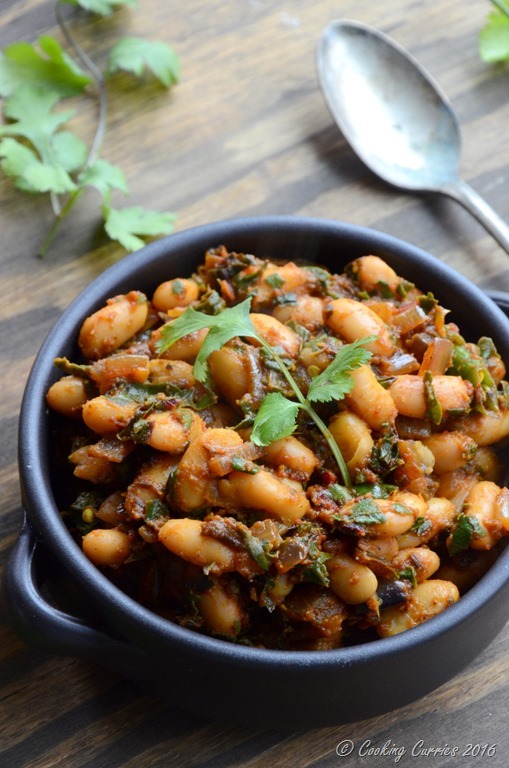 Enjoy them with the chard bean sauté! Heat the oil in a heavy bottomed pan on medium high heat. Throw in the cumin seeds and let them turn color. Quickly add the onions and the ginger garlic paste. Saute well. Add the spice powders, mix well and let it cook for a couple of minutes. Add the pureed tomatoes, mix well and cook till most of the liquid is absorbed. 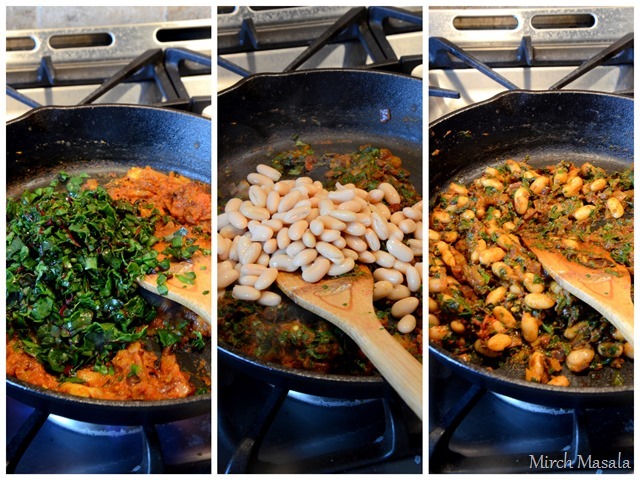 Now mix in the chard and once it wilts, add the beans too. Add salt. Mix well. Let it all come together on medium low heat for a few minutes. 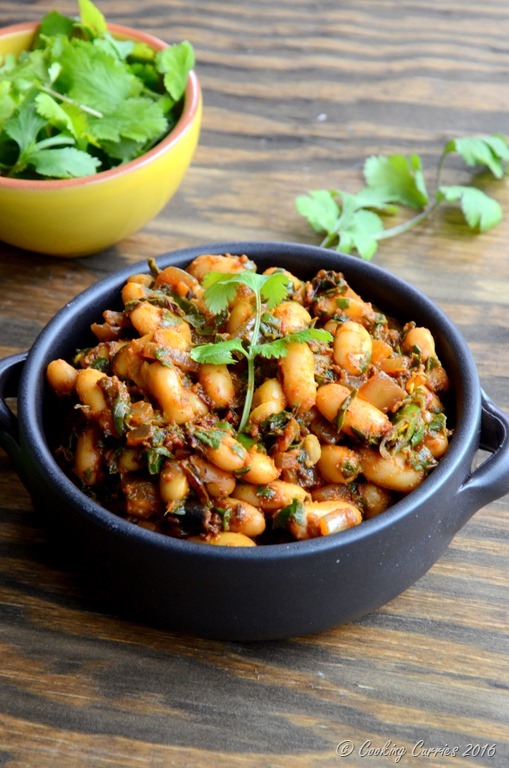 Remove from heat and garnish with cilantro sprigs or you can chop them finely and garnish too. 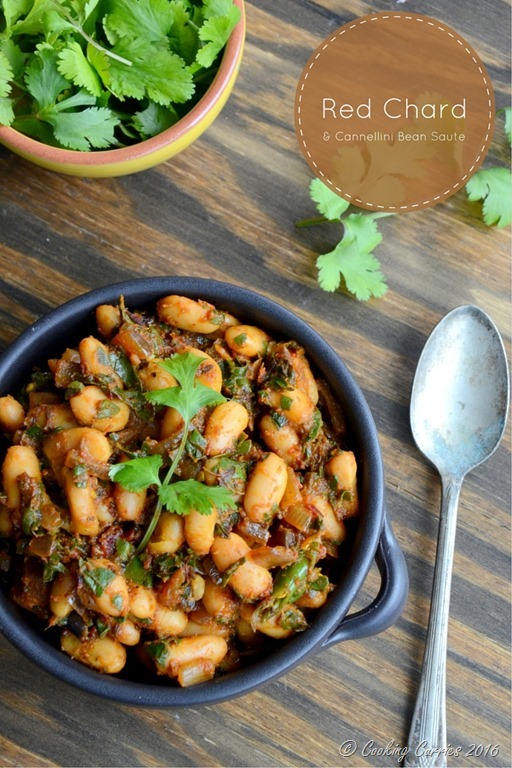 What a fabulous quick dish! Perfect meal to me! This is totally my kind of meal. It has everything I love in one flavorful bowl. My mom makes a very similar dish and I love it! This sounds so good! Right up my alley. My kind of food. Simple but absolutely full go flavour. It sounds delicious. This looks so so so delicious! I love every single ingredient in them, the flavors sound fantastic and the pics looks amazing!